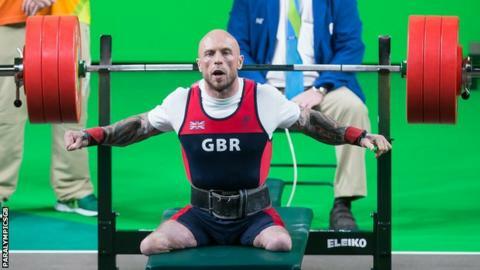 Micky Yule won a second European title as Great Britain claimed three more medals at the World Para-powerlifting European Championships in France. The Scot lost both his legs eight years ago when he stepped on an improvised explosive device while serving with the Royal Engineers in Afghanistan. He won -80kg gold at the last Europeans but this time dropped back to -72kg. The 39-year-old lifted 177kg with team-mate Nathaniel Wilding managing 165kg for silver. There was also a bronze in the -65kg event for fellow Briton Ollie Brown. The gold was a small consolation for Yule after he finished fourth at the Commonwealth Games on the Gold Coast last month. He recovered from a broken femur (thighbone) to compete in Australia but finished just short of a medal for the second Commonwealths in a row.